How to Select the Best Portable Stump Grinder? Knowing how to select the best portable stump grinder for the money can be challenging. After all, there are so many things that should be taken into consideration. In order to find out which portable stump grinder is the best for your situation, you need to have a fair idea of the work you will be carrying out. Are you clearing a full lot or are you doing a bit of backyard maintenance? There are several different kinds of walk-behind stump grinding machines, but not all have the engine size to handle smaller or larger jobs. Within this buying guide, we aim to show you a range of portable stump grinders that may suit your current situation. Your safety whilst using any kind of power equipment is paramount. However, special care should be taken when you’re using a portable stump grinder. The user should wear eye and ear protection at all times, as well as ensuring the machine is in good working order. You should also check to make sure all safety guards are attached to the machine and don’t feature any cracks or imperfections. The machine should also be clear from debris so as to avoid any wood flying out of the machine and potentially injuring someone. In a commercial or industrial setting, it also pays for the operator to be supervised when the machine is in use. The biggest mistake people can make when they’re shopping for a stump grinder is choosing one that’s not fit for purpose. A buyer should pay careful attention to the engine capacity in order to get a fair idea of its limitations. There’s no point buying a portable stump grinder with a large engine for a small job. However, you would struggle if you purchased one with a small engine for a large job as well. Portable stump grinders are fairly similar in their specs and features, regardless of the manufacturer or brand. Of course, there are variations in design, but the simple make up of a portable stump grinder is fairly consistent. They generally consist of a cutter wheel with fixed carbide teeth. This cutter wheel is controlled by hydraulic cylinders which push the head through the stump laterally to raise and lower it. They also feature a handle which ultimately gives it a similar style to a lawnmower. Because stump removal can generally be a rather dangerous task to undertake with a stump grinder, it pays to keep maintenance up-to-date. Operators must ensure all hydraulic cylinders are in working order, all lines are clear, and all fluids are regularly replaced. You should also check to make sure there is no debris wedged in moving parts, and that all greasable components are moving properly. Replace any worn or damaged parts and if in doubt, call in the experts to complete a full and thorough service. Stump grinders are complex pieces of machinery that aren’t cheap to buy. That’s not to say you can’t get a good deal when you buy online or in competitive stores, but you do need to open your wallet a little further than normal. You can expect to pay upwards of $1500 for a stump grinder, but in some cases it’s better to spend more. Not all brands will offer you the exact features you’re after, so in order to get that stump grinder you want, don’t be afraid to go a little higher. It has a reliable Honda engine. It’s relatively affordable on the market. It’s not self-propelled – you have to move it manually. It can’t cut large stumps. Oil can get into the combustion chambers when tipped up, causing it to smoke. 2 year parts, 2 year labor warranty. Stump Diameter Capacity: 10 inches above grade, 9 inches below grade. Warranty: 2 year parts, 2 year labor warranty. QWhat kind of start type does it have? QHow large are the tires? QWhat size is the cutting wheel? A9 ⅔ x ⅜ inches. If reliability is what you’re looking for, you get all that and more with this North Star stump grinder. 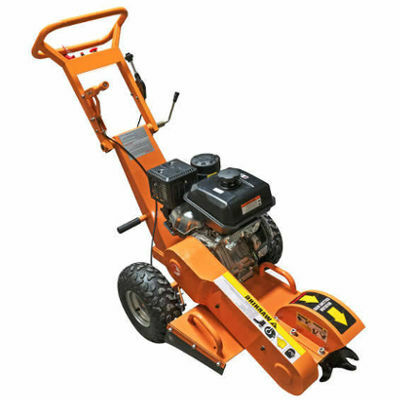 It’s not only top rated on the market, but it also offers plenty of power and features in comparison to some other stump grinders on the market. It’s suitable for both small professional jobs, as well as backyard maintenance. Overall, it’s one of the best stump grinders for the money. Check out what other people who purchased this product think about it. Read North Star portable stump grinder reviews. In relation to the price, it offers a huge amount of good features. It has a thick and durable cutting wheel. The cutter wheel needs redirected when it hits a stone or something hard. It’s not self-propelled, so you have to walk it. Dimensions: 42 x 51 x 72 inches. Stump Diameter Capacity: 20.25 inches tall and 9 inches below ground. QWhat starting system does it have? QHow thick is the cutting wheel? A12 inches with nine teeth. If you’re looking for the best deal when you buy online, you can’t look past this Samson Machinery stump grinder. It offers the operator pure power in the form of 15HP, as well as being suitable for a range of stump cutting tasks. It’s affordable, costs very little to run and maintain, and is provided by a trusted manufacturer. Overall, this portable stump removal machine will get the job done with ease. Check out what other people who purchased this product think about it. 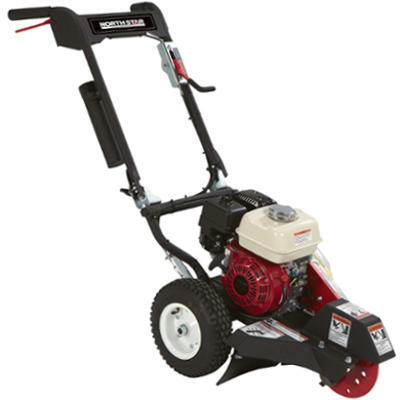 Read Samson Machinery portable stump grinder reviews. It has good safety shutoff features for in emergencies. It’s top rated on the market. It’s for sale at an affordable price in comparison to other makes and models. It’s a lot heavier than other stump grinders on the market. The throttle cable is too long and can get in the way. The connectors and wiring are thin, small and flimsy. Stump Diameter Capacity: 20 inches tall and 9 inches below ground. QHow big is the blade? A12 inches x 3.5 inches thick. QWho is best to operate it? ASomeone with a lot of strength. QWhat kind of brakes does it have? ADisc drum brakes for pivot cutting. Although the Power King represents good buying, it takes a very strong person to operate it with full confidence. 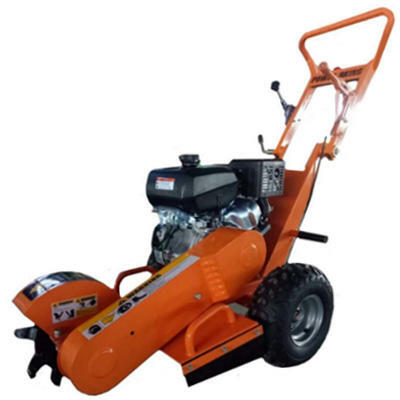 It’s heavier than other stump grinders and root removal products on the market, and can be difficult to start. However, it’s easy to maintain, affordable to buy, and it is a reliable piece of grinding equipment that will grind stumps with ease. Check out what other people who purchased this product think about it. Read Power King portable stump grinder reviews. It removes stumps quickly and safely. It can cut deeper than other stump grinders. It features modern technology to make stump removal easier. It’s quite expensive in comparison to other models on the market. Stump Diameter Capacity: 12 inches deep. QHow deep can it cut? AUp to 12 inches deep. QWhat kind of clutch does it have? AA NORAM automatic centrifugal clutch system. QWhat are the dimensions of the cutter wheel? AVertical 14 x ⅜ inches. 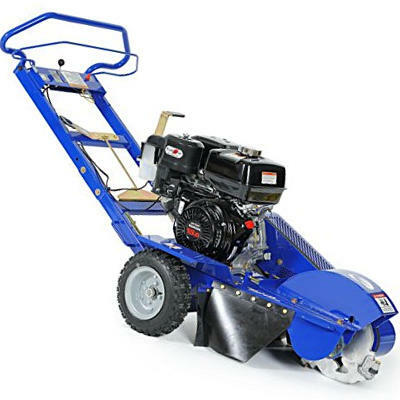 Although it’s more expensive than other stump grinders on the market, this Bluebird product is reliable, hardy, durable and will complete a range of stump removal tasks with ease. It can cut deeper than most other portable grinding machines on the market, and even comes with a three year warranty. It’s a lot heavier than other grinders but its powerful 13hp engine ensures the weight is not without power to give it extra push. Check out what other people who purchased this product think about it. Read Bluebird GX390 portable stump grinder reviews. Its cutting wheel is larger than many other brands on the market. It’s narrow to fit into small areas. It has good safety features. It can be cumbersome to transport. Dimensions: 50 x 80 x 29.75 inches. Stump Diameter Capacity: 10 inches. QHow big is the cutting wheel? QWhat kind of tyres does it have? QHow many teeth does it have? If you’re looking for a handheld stump removal product which can undertake both residential and industrial tasks with ease, this Holt Industrial grinder is the tool for you. Although it’s heavy, it has the ability to cut stumps of 10 inches in diameter. It also has as powerful 389cc engine from Honda, a reliable brand. Its cutting wheel is larger than others on the market, and it’s also very agile in order to get into hard-to-reach places. Overall, this is one of the best portable stump grinders for the money. Check out what other people who purchased this product think about it. Read Holt Industrial HGW13 portable stump grinder reviews. 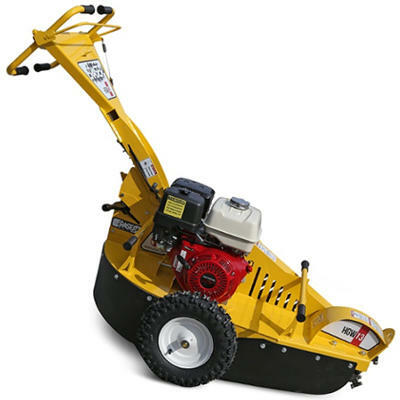 Where to Buy Portable Stump Grinders? Walk-behind tree stump grinding machines can be purchased in any store selling heavy duty outdoor power equipment. However, if you’re looking to get the best deal, we recommend buying online, on websites such as Amazon. Amazon also has plenty of customer reviews that can help you in your buying decision.